34 people have viewed this property this week. 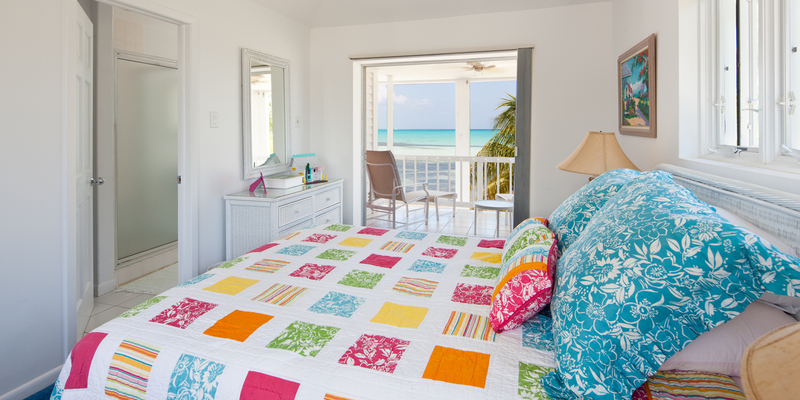 Welcome to We’ll Sea, a charming 2-bedroom beach cottage on perfect white-sand beach with clear, shallow waters ideal for barefoot swimming. 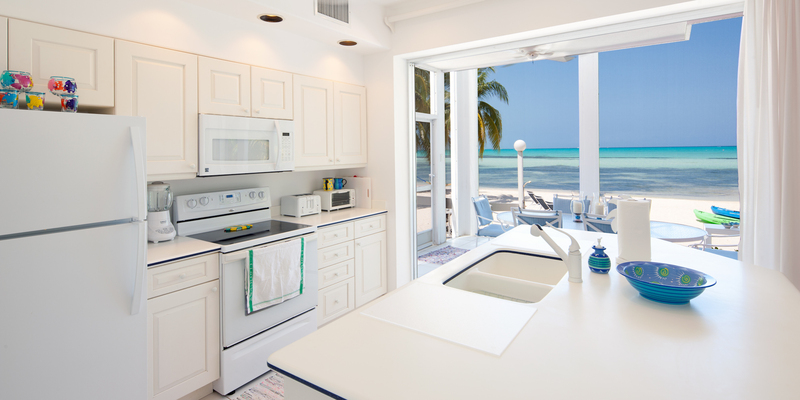 Located on Grand Cayman's north side, just 250 yards from the iconic Rum Point Club, We'll Sea is one of the last affordable rental villas on this “Millionaire’s Row” of luxury homes along Sand Pointe Road. Each year, most of the smaller villas are razed to make way for large palatial homes for the island's international wealthy. 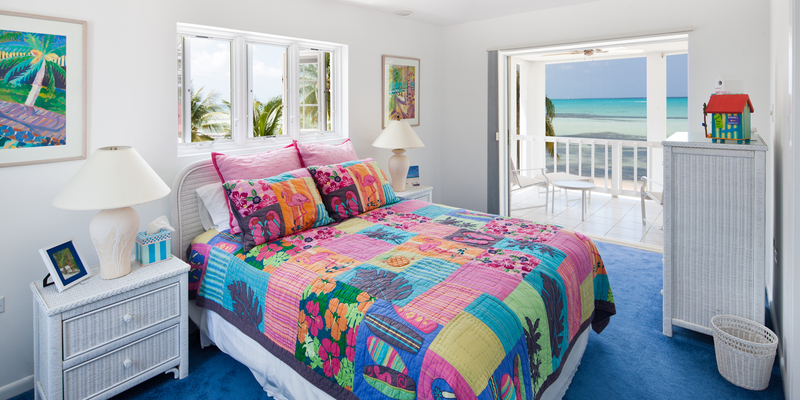 The American owner of We’ll Sea loves the home's simplicity and unbeatable location. He and his wife reside here 8-12 weeks a year and also enjoy sharing their home with our guests. 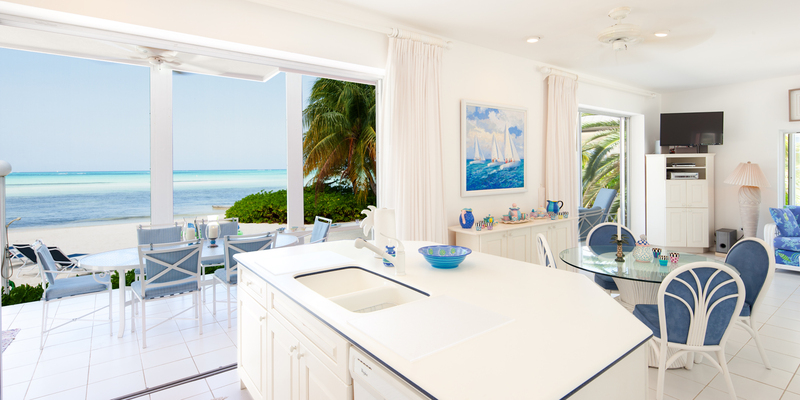 We'll Sea features a unique, two-story atrium and beachfront screened porch that floods the home with natural light and spectacular ocean views. The kitchen, dining, and living areas open onto a spacious screened porch with patio seating and outdoor dining table for six. A full modern kitchen, just off the atrium, comes equipped with standard appliances including dishware, glassware, cookware, cutlery, and an indoor dining table for four. 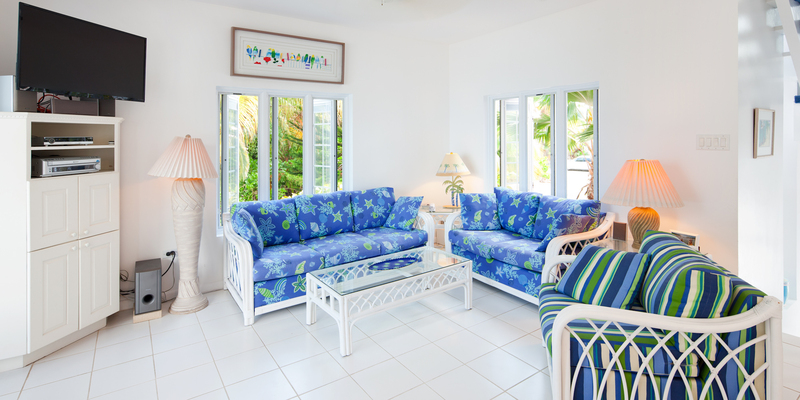 The ocean front living area comes furnished with comfortable sofas, ceiling fans, and a flat screen TV for winding down at the end of the day. Both bedrooms are on the upstairs second floor with queen-sized beds and private en-suite baths with nice-sized bathtubs and separate stand up showers. 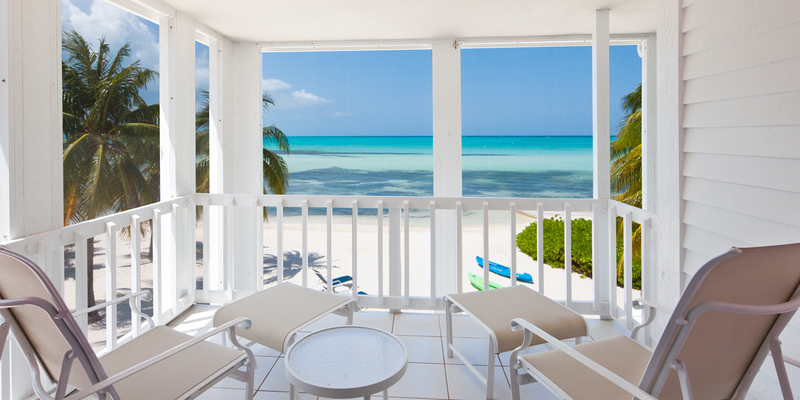 Both suites feature private oceanfront balconies to enjoy the spectacular views. *Note: Silver Thatch kayaks and stand up paddleboards (SUPs) available for discounted rental. Signed waiver and 5 day minimum required with 6th and 7th day free: US$39 per day per kayak/SUP ($195 per week/each). Paddles included. 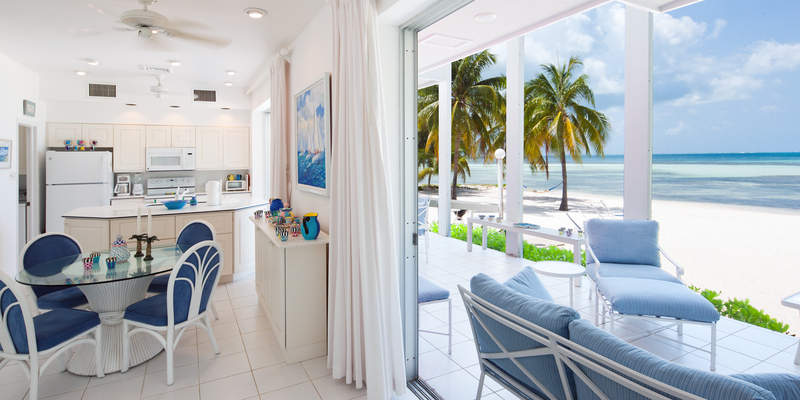 The homes on the soundfront in Cayman Kai offer the best beaches as they don't have as much marine and plant life inhabiting the shallow waters. The beaches here are usually soft white sand. The homes facing west enjoy barefoot swimming in calm shallow waters. 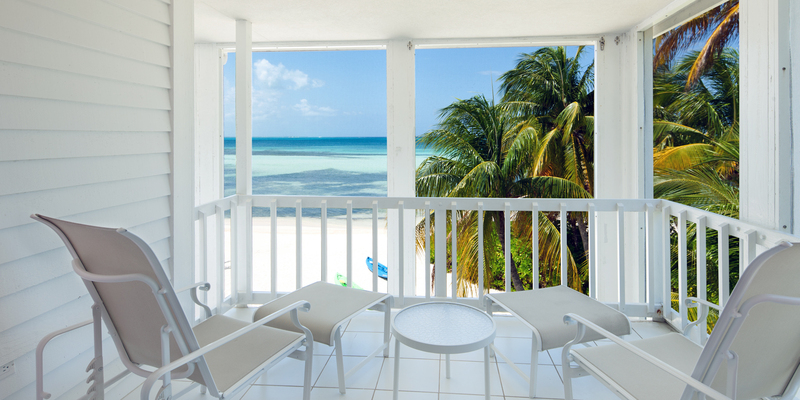 We'll Sea has a perfet white sandy beach with wonderful sunset views! We thoroughly enjoyed our stay at We’ll Sea. We appreciated how everything looked exactly as shown in the pictures. The house and yard area was very clean and well maintained. The beach was great for our two year old as she could play easily without wearing a life jacket. While Seven Mile beach is a nice area to check out we loved having our own private beach area. We only saw a handful of people walk by all week. Our favorite places to eat included Tuka, the Lighthouse, and the restaurant at Rum Point. 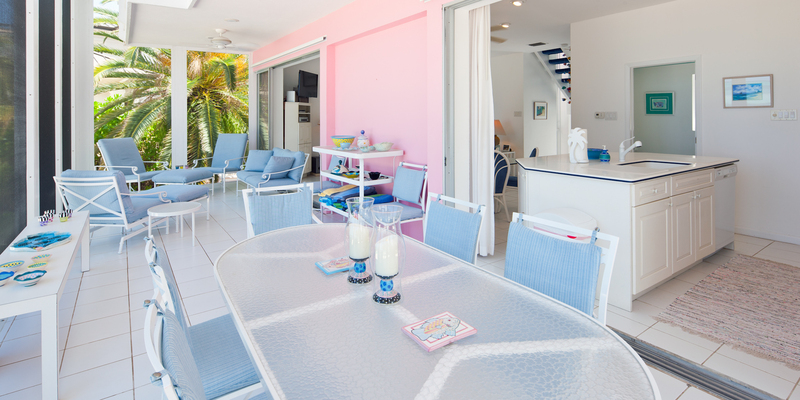 It was a great vacation and we would definitely recommend this or any other property listed through grand cayman villas. We didn’t need to contact the property manager for anything but it was great having the contact information just in case. Thank you for your review. We'll Sea is a special home! We had an amazing time at We\'ll Sea! First of all the sunsets on the private beach were stunning! The kitchen was sell stocked, everything was clean and tidy and the screened in porch as amazing for meals and resting out of the sun. Having kayaks and bikes was great! We biked down to starfish point several times, amazing! The location is wonderful, as we walked to Rum point for drinks and food and loved the environment there as well. We wish we\'d known about the ferry from Rum point to Georgetown so I\'ll put it in so others can take advantage. A GREAT way to see the water and enjoy Georgetown without having to drive over. We will be back for sure!! Thank you for making our trip so amazing. 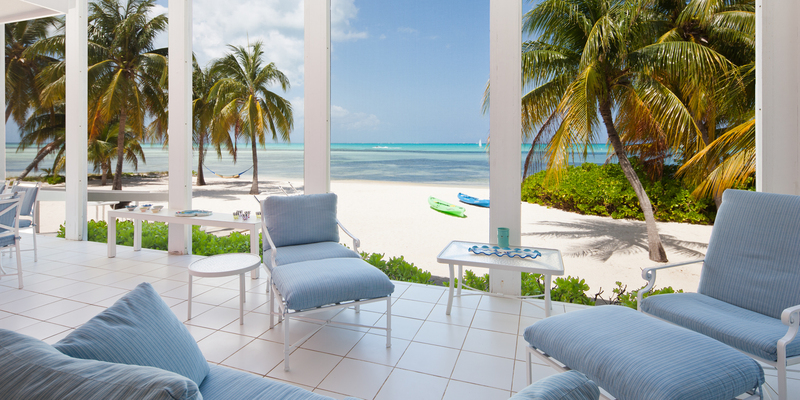 Great Spot to relax and take in the Grand Cayman lifestyle. We were lucky enough to stay at We\'ll Sea at the end of May 2018. 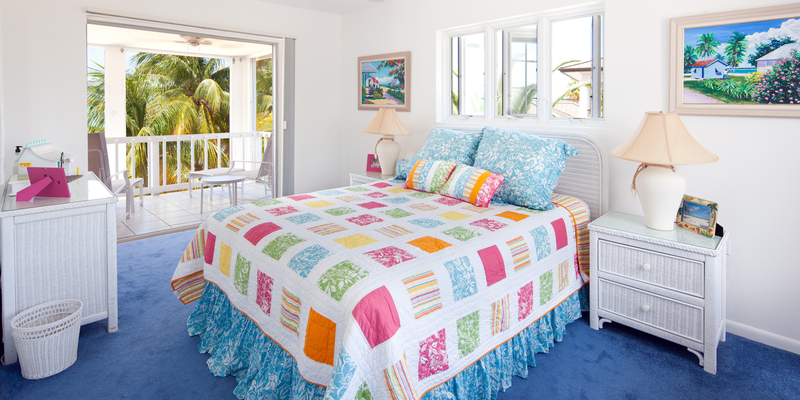 The house is beautiful, more than spacious enough for 2 couples and within 20\' of the ocean. I have been a fan of Rum Point since i first came to the island in 2002. When my wife and I decided to make Grand Cayman our destination for our 10th anniversary trip i could think of no better place than Rum Point. We found We\'ll Sea and it met all of our needs. 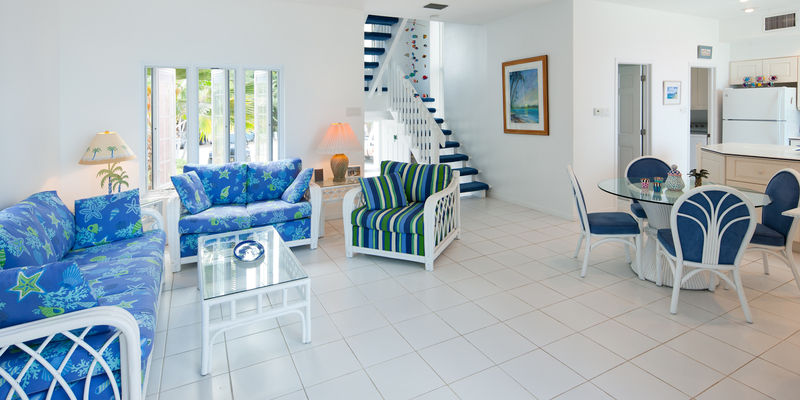 Less than 50 Yards away from Rum Point and miles away from 7 mile beach. The house is well stocked with cooking utensils, pots, pans, and a charcoal grill. The lanai is great and even protects you well in downpours (we have 2.5 days of them). The ocean is just steps from house and is very shallow for 50 yards. I would bring some water shoes because you have to walk through sea grass until you get to sand. Other than that it was a wonderful experience at a fantastic house. I will be back to We\'ll Sea and i look forward to the great experience. Gorgeous ocean front villa, lovely vacation! Fantastic location! Would like to stay forever!!! Thank you for your kind words! We'll Sea . is a beautiful home on a fantastic slice of heaven! How about that view!!!! What a BEAUTIFUL home! It was better than the pictures indicated (and they were good!) Absolute perfection, right on the gorgeous blue waters, we put the kayaks to good use. ( The only thing was the bikes had flat tires and there was no pump.) We loved having that gorgeous kitchen and washer dryer! Anyone who has Netflix can sign on to watch on the TV. This little gem was so peaceful and quiet, yet close enough to great restaurants and activities. We will be back!!! We stayed a week at the best spot on the whole island. It was on a beautiful beach (just as great as 7 mile beach AND a lot more private) that we didn\'t have to share with anyone! Water was so warm and crystal clear. No rocks to step on and it was ankle to waist deep for at least 150 yds out. With the exception of one day, the water was very calm. There are initially some short weeds to wade through and beyond that it is just white sand. Great area for using the 2 kayaks that come with the house. This is away from all the tourists and buzz of Georgetown and worth the 40 min drive away from all of that. Close to 2 bars/restaurants (walk or bike) and bike ride to Starfish point. Short distance to liquor/grocery stores. Beach has 4 lounge chairs, 2 little tables and a hammock to relax on -- and plenty of areas for either shade or sun. Some boats & jet skis go by further away but not disruptive. Far enough away from Rum Point that you can\'t hear the people or activities; however sometimes public cars are parked in front of the house on busier days. Saw a few stingrays swim by; no jellyfish but some sea urchins and random fish. A few cats visit the yard but don\'t get very close to humans. House is fully stocked w/a charcoal grill, plates, utensils, blender, toaster, toaster oven, coffee maker, kitchen appliances. 4 bicycles (for adults). 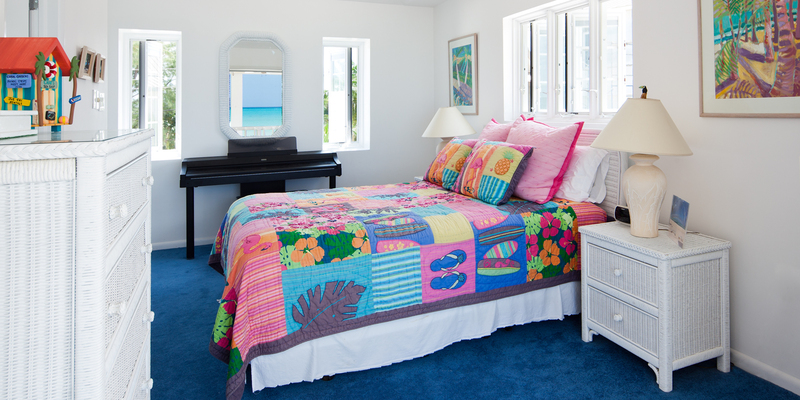 Beach towels, towels/linens. Very clean home and nicely updated. Would stay here again in a heartbeat. We had a great time in the We\'ll Sea property. The beach was beautiful and the home location was peaceful. The property management folks were helpful through the whole process. Looking forward to another stay! This house is perfect for a relaxing time for 4 adults. the location on the beach is perfect. 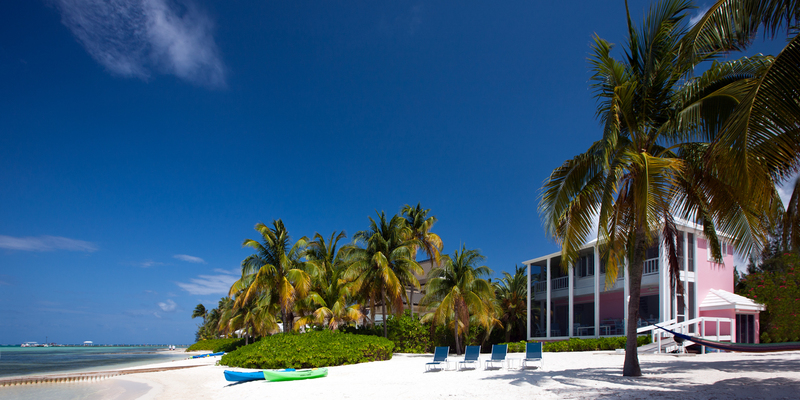 We could walk down the beach with our feet in the water to have drinks or dinner at the rum point beach club. the ac works wonderful. We will come back here, but next time we will bring some food from home as the grocery cost and selection are not what we would like. This property was perfect for a family. The house is spacious and well kept. Everything was clean and well furnished. The location was perfect with the calm waters and private beach. We had a toddler and the water was perfect for her as far as depth and lack of rolling waves. We explored everyday in shallow waters and made excellent use of the kayaks! The proximity to Rum Point was ideal and convenient. We also loved and highly recommend the Bioluminescent tour and Stingray City that leave from Rum Point. If you\'re looking to be in the middle of lots of restaurants and night life, this is not the place for you. If you\'re looking for a quiet escape this is perfection!! The location of We'll Sea is just about perfect, on the best part of the beach especially if you have young kids. 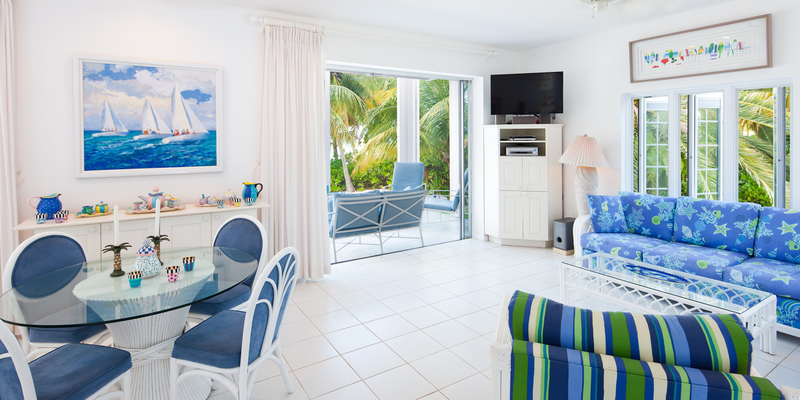 It is far enough from the public beach but close enough to enjoy the nearby amenities of Rum Point. Water is calm and you can easily snorkel out, we saw numerous Stingrays and lucky enough to have a wild dolphin swim with us for about 5 minutes all in our backyard. The place was extremely clean, and had a lot of extras including Kayaks, the wireless internet worked great too. Had everything you need in the kitchen if you decide to do any cooking too. Carpets upstairs were also very new. All in all a perfect beach vacation. We'll Sea was a wonderful experience. The home was clean and comfortable. 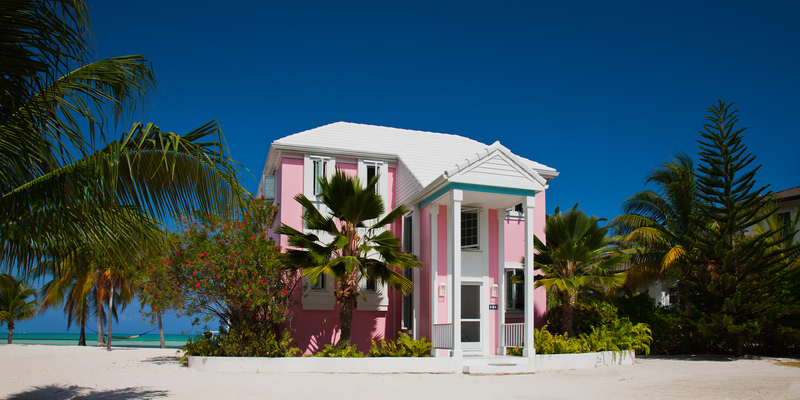 It was decorated in a happy, cheerful way that reflects the setting and the pink house very well. 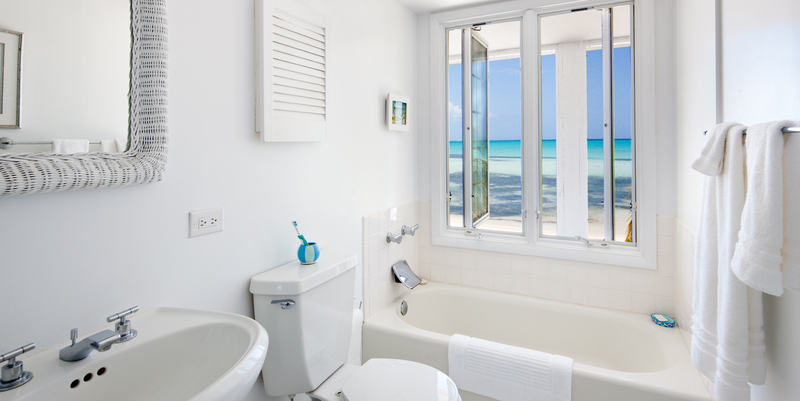 Pick up a conch by walking on your private white sand beach out into the sea right in front of the house! We got one we suspected was eaten by out of season poachers, discarded, but we saw live ones as well. (Not absolutely necessary, but recommended to have water shoes) Management were readily available and responsive. The kayaks were fun, but the seat straps were torn. Make sure they have been fixed, or your paddling will be tedious. Two nice bedrooms each with a private full bath, which is not clearly stated in the ad we read, so we were pleased. A stunning sunset provided a perfect backdrop to our private wedding on the beach. It was a beautiful, as was my bride. 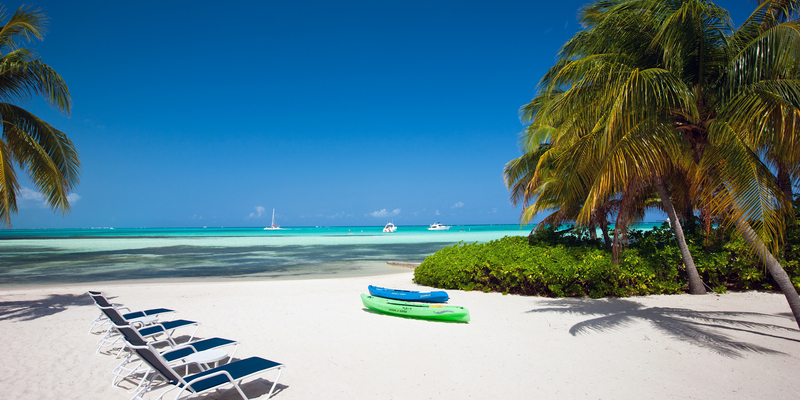 And for an adventure of a lifetime, go to Rum Point for a trip out to play with the StingRays! wow.